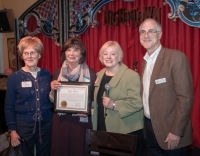 Friends of Kaye Lowe gathered at Nighttown on Jan. 16, to honor her upon her retirement after 18 years of service as executive director of the Cedar Fairmount Special Improvement District (CFSID) and its predecessor, the Cedar Fairmount Business Association. Members of Cleveland Heights City Council presented her with a plaque at the event. CFSID has named Heights resident Myra Orenstein its new executive director.